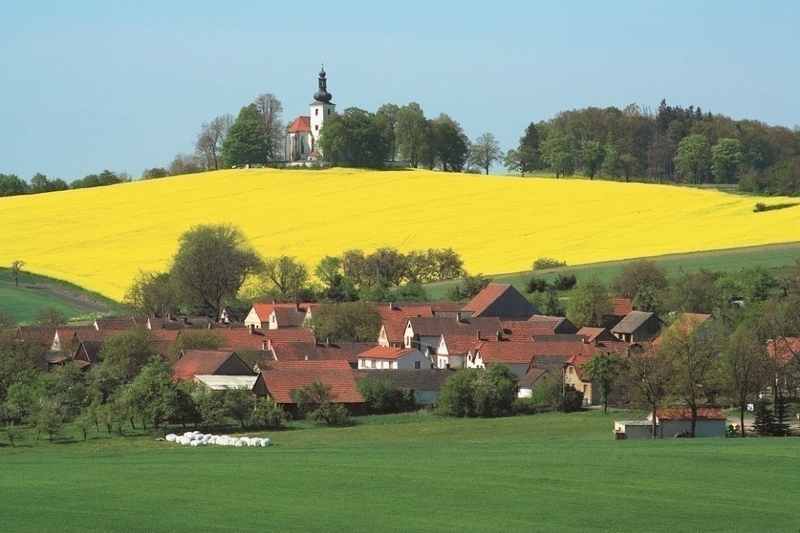 The picturesque landscape of the Tábor region offers ideal conditions for outdoor activities. Tourists and ramblers can use the dense network of marked walking trails in easy to moderate terrain to get acquainted with a variety of sights and natural landmarks. In accordance with the nationwide marking system of the Czech Rambling Club, the trails are marked with white square signs with a red, blue, green or yellow colour band in the middle. The trails bring tourists to the most interesting and attractive places in our region. 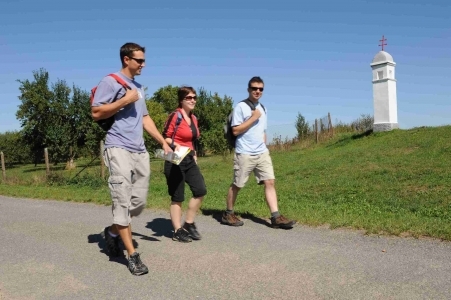 Today a network of more than 630 km of hiking trails covers the Tábor region. 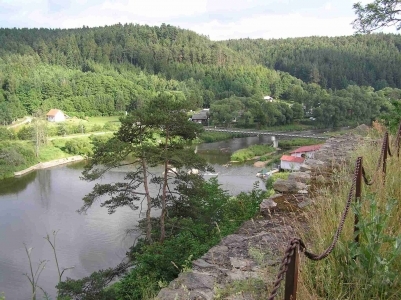 The slightly hilly land (especially in the north of the region) and the deep valley of the River Lužnice between the towns of Tábor and Bechyně, the large number of marked trails, nature trails and nice weather provide ideal conditions for rambling. Marked paths throughout the Tábor region will take you to popular tourist sights such as the pilgrimage church in Klokoty, the ruins of Kozí hrádek, the Old Castle near Borotín, Šelmberk, Choustník and Příběnice, the Hýlačka lookout-tower, Chýnov Cave and more. 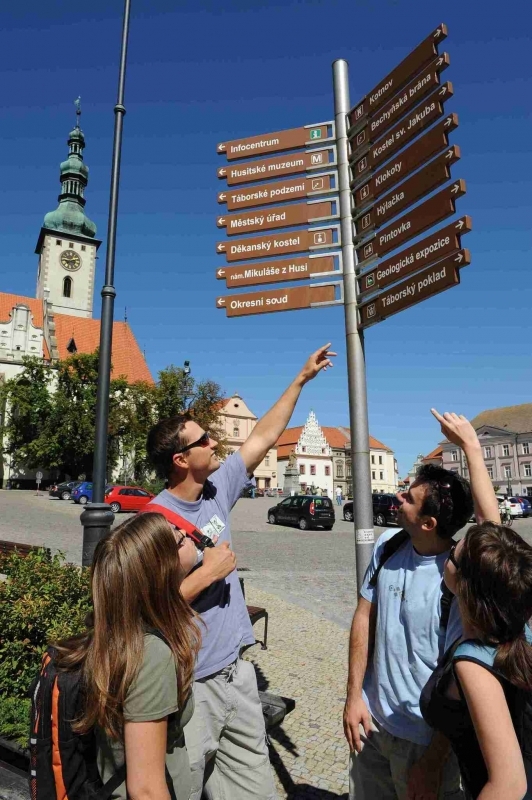 You will find route signposts in Tábor in front of the railway station, on Křižík Square and in front of the Bechyně Gate. Maps covering the Tábor region: Edition KČT - Táborsko jih a střední Lužnice – No. 76 and Česká Sibiř a Táborsko sever – No. 41, 1:50 000); SHOCart - Táborsko, Dolní Lužnice – č. 38, 1:50 000; Kartografie Praha - Táborsko, Třeboňsko – č. 22, 1:100 000. For all those who love walking in nice weather, we recommend a one day trip to the ruins of Příběnice Castle. 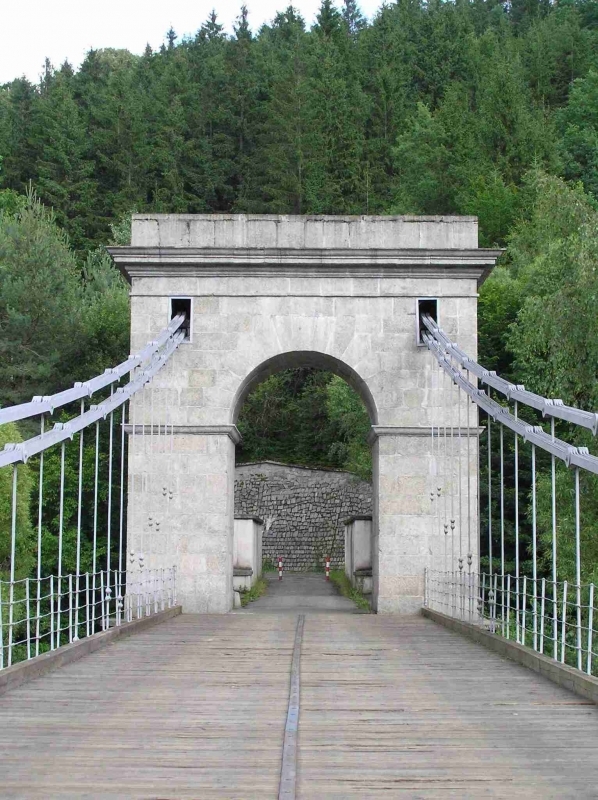 The 12.5 km red marked route takes you through the most beautiful part of the River Lužnice valley. It begins in Tábor in front of the railway station. You will go through the city centre to Švehla Bridge, cross it and then descend to the Lužnice River and continue along its left bank to the ruin of Příběnice Castle. 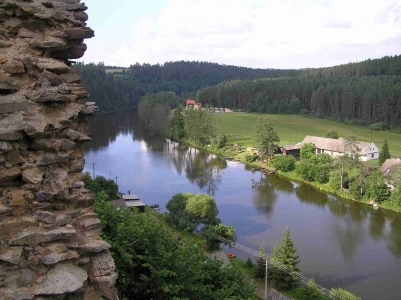 After taking in the view of the remaining walls of the castle and the deep river valley below, you can take a break at the Přiběnice Restaurant. Then you can either continue towards Dobronice Castle near Bechyně or return to Tábor along the yellow trail (via Dražičky). Another possibility is to continue along the blue trail to Malšice and return to Tábor by train or by bus. In the centre of Tábor there is a 4 km marked route called the “Learn about Tábor and Keep Fit” walk. In approx. 75 minutes you will get to know the 31 most attractive sights in Tabor (Žižka Square, Pražská Street, Jordán Dam, Castle Kotnov and Bechyně gate, Ctibor Mill, The River Lužnice, Čelkovice and Parkány). The route includes 369 steps and an altitude difference of 119.6 meters, so you will have the chance to test your physical condition. 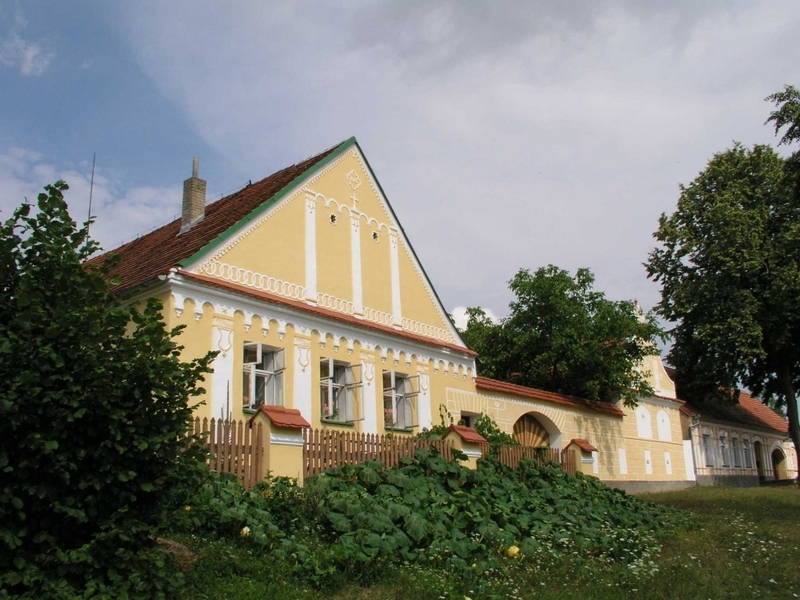 A description of the tour and the historic sites to be seen on the way is available at the Tábor Tourist Information Office. This nature trail is situated close to Tábor town centre in the Pintovka forest high above the valley of the River Lužnice. The starting point of the trail is 1.2 km away from the centre (on the way to Bechyně). At 30 stops along the trail, you will be acquainted with species of trees and herbs and other points of interest. The Borkovice Marshland nature trail is a frequent destination for ramblers and botanists (20 km south of Tábor, 7 km southeast of the town of Soběslav – the starting point of the trail is about 1.5 km from the car park). The tour takes approx. 2 hours and includes a 5.5 km walk along paths of wooden boards and thirty stops acquainting visitors with former methods of peat mining, peat bog flora and fauna and the characteristic features of this gloomy area. The marshes were declared a nature reserve in 1980. The name of the marsh is derived from the word borek – an extracted block of peat. The marshes cover an area of 54,65 ha. In the past peat was mined here manually using specially modified spades; the extracted blocks were then dried and used for heating. Today peat is no longer being quarried and only a small part remains, which is now used for balneological purposes. The area is also home to rare plants such as the mud ledum, the marsh pine and the round-leaved sundew. The marshland became famous not only due to its natural beauty, but also due to its folk architecture called South-Bohemian peasant Baroque. The structures of folk architecture have been preserved in Borkovice, Mažice, Zálší, Záluží, Klečaty, Komárov and others. The Veselí Sand Quarries is an area 2 km southeast of the town of Veselí nad Lužnicí (on the southern border of the Tábor region), stretching across an area of 240 hectares. The five gravel lakes were formed following the mining of gravel sand in the years 1952 - 1986. 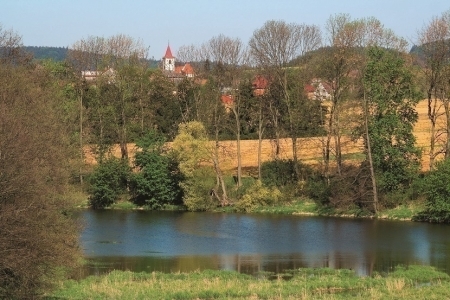 14 information points along this 7 km trail, located on the banks of two lakes, (part of the Třeboň protected wilderness area) acquaint visitors with unique aquatic and terrestrial flora and fauna, which has adapted to life in the sandy soil. One of the stops along the trail is the Písečný přesyp (Sand Dune) nature reserve near Vlkov, almost one hectare of desert, with its own unique flora and fauna. In summer, the gravel lakes are also a popular destination for swimming and recreation. Takes in the southern and western environs of the village of Nadějkov. Information boards at 15 points along the trail document the history of the village and its surroundings, the unique characteristics of the countryside and the diversity of flora and fauna. The first information board is located on the front of the vicarage in Nadějkov, the first trail sign (white square with a diagonal green stripe) can be found on the lower end of the village square. The trail is 13.5 km long and can be divided into two sections. The first section includes stops 1 – 8 (you can return to Nadějkov from point no. 8. along the main road); the second section includes stops 8 – 15. The original plan to establish a nature trail here was encouraged by efforts to prevent the insensitive re-cultivation of the landscape. Based on a petition against the underground storage of radioactive waste, the “Zachovalý kraj” (Preserved Countryside) citizens’ group was formed, which, in collaboration with the voluntary group “Fikar” and the commune of Nadějkov marked the trail and published a printed guide.